Shravan month is the most looked forward to by one and all, this is purely because of its many many festivals and rituals that bring everyone together to celebrate this beautiful month of gods. Shravan month marks the celebration of many things, one among them is welcoming the rains. This is a perfect time for tourists to visit holy places and places of heritage. With its grand celebrations and festivities happening all around, it will be a sweet treat to the eyes. Shravan Purnima and Raksha Bandhan will be celebrated on 20th August 2013. Shravan Purnima is the full Moon day in the month of Shravan. Many rituals are performed on this day. Most important ones among them are Upakarma or Upanayana, which is the ritual of changing of sacred thread. Shudhikaran ritual is performed by Brahmins on this day. People who have Chandra Dosha perform Puja to Moon on this day to get rid of the ill effects of Moon. 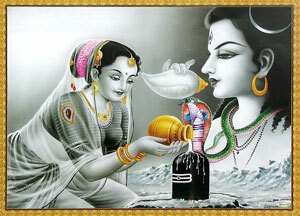 The month of shravan is a very important month for Shiva devotees. It is believed that Shiva is at his most calm state and with the right puja’s and prayers you will granted with his blessings. Raksha bandhan is a festival celebrated to solemnize the beautiful bond between brother and sister. This festival is celebrated all over India with much zeal and fervour. Colourful rakhis are tied to the hand of the brother and the sisters are given gifts in return.